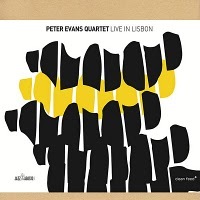 Talking of playing major festivals, that’s exactly what Evans did last year when he took his own quartet – with pianist Ricardo Gallo, bassist Tom Blancarte and the irrepressible Shea – to Lisbon’s Jazz em Agosto. Here, the references to jazz history are even more explicit, with the trumpeter deliberately setting out to work with (within and without) the changes of well-known standards, including Jerome Kern’s “All The Things You Are”, Billy Strayhorn’s “Lush Life”, Cole Porter’s “What Is This Thing Called Love” and – my favourite – “Duke Ellington’s Sound of Love” by Charles Mingus. Mingus is very much the palimpsest (that’s the title of Evans’ cover version) here, having done the same thing to the Kern and Porter chestnuts on his own Presents Charles Mingus album half a century ago, and Evans’ work with complex harmonic modulations, shifts of tempo and elaborate arrangements has more in common with Mingus than it does with 60s free jazz, which all but abandoned harmonic changes altogether. It’s all very impressive – almost too impressive, especially on the closing “For ICP”, where the band insist on playing the frighteningly intricate rhythms of the cycling four-note theme in unison (tantamount to showing off, if you ask me – as anyone suspected for a moment they didn’t know how to do it in their sleep), and the capacity crowd in the Gulbenkian Foundation no doubt lapped it all up. But, thankfully, the voluminous applause was edited out on the disc. Just as well – we wouldn’t want all that praise to go to Mr Evans’ head now, would we?